Thank you Kensington for making the most useful battery case the iPhone 4 has ever seen. Kensington's new BungeeAir Power Wireless Security Tether battery case is a slim 3-in-1 case that not only can it juice up your iPhone 4 with its built-in 1500mAh battery, but perhaps the most useful feature it packs is a wireless security alert system that will alert you should you forget your iPhone 4 and it'll alert you right away even before you can get far away from it. When the BungeeAir case senses that it has been left behind, it will immediately alert the BungeeAir key fob that you'll be carrying around with you that will alert you by loud beeping noises as well as vibration. 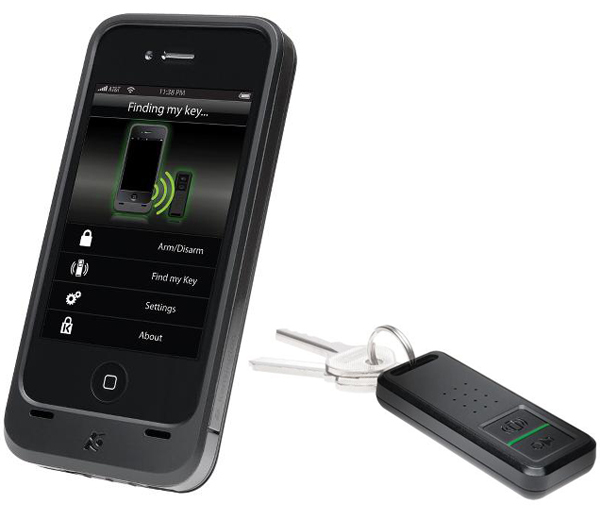 It will also lock your iPhone 4's screen requiring a passcode as a precautionary step in case someone is quick on their feet to find your missing iPhone 4. It also has a built-in stand for landscape and portrait viewing angles. Apple should really consider handing these out to its employees from now on. The BungeeAir security system also works both ways in case you lose your keys with the BungeeAir key fob attached to help you find them quicker. There is of course a limiting proximity in which both wireless receivers can work in and that also depends on the environment. An average distance of 50 feet is the limit in which both BungeeAir receives can operate in. The BungeeAir Power Wireless Security Tether case will be available for $99.99. A battery-less offering is also available for $79.99. Video after the break!